• Highest mattress quality for many years. 1) Upper comfort layer, sponge padded with quilts. 2) High quality polyurethane layer. 3) High quality flexible insulation layer. 5) High quality Bonell springs system. 6) Bent and flexible health spine in beech wood. 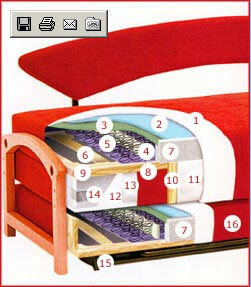 8) Insulation layer at the mattress's bottom. 9) Frame of mass wood. 11) Soft, insulating polyurethane layer. 14) Corner metal support for perfect strengthening of the bed's frame. 15) High riser lifting device for easy opening of the lower mattress. Wieder, which specializes in the day beds and beds for teenagers, leads the furniture market in USA, and has been doing so for many years. Experienced craftsmanship, combined with state of the art, and most modern equipment lead to uncompromising meticulousness with quality as manifested not only by the high standard of manufacture, but also by innovative design. The Wieder's strong commitment to maintain the highest standards is made possible mainly by the nature of the company as a wholly family owned business. Wieder's new collection offers the same well-know quality in a line of splendid, new models with more technological innovations that places Wieder - and you - another step ahead. Spoil yourself this year! Wieder presents its Back-Up mechanism to raise and support your head and back. The mechanism is fitted to a variety of sofas in Wieder's new line and it can be operated electrically, pneumatically or manually and let's you read, study, watch television or just loll in extreme comfort at any height you like.